This has been a good month for the program despite the drought which continues to affect East Africa. Let me start with an explanation of how that drought is affecting our program. The cost of any product is based on the supply and demand for that product. When production goes up or supply goes down, the cost goes up. With the drought – which must be noted is hitting the North-East part of Kenya far harder than it is our area around Kikima– people are less able to grow food. This means that they must purchase more food, while less is generally available because others cannot grow it either. This causes a general increase in the price of food which ripples throughout the country and the entire region. Our orphans and their extended families have been able to grow less of their own food, which has made them even more dependent on the monthly food distribution to survive. However we now have to pay much more for the food that we distribute – in some cases staples such as corn meal have more than doubled in price – from 35 to 85shillings per kilogram. We have made a commitment not to change the amount of food that we have distributed. 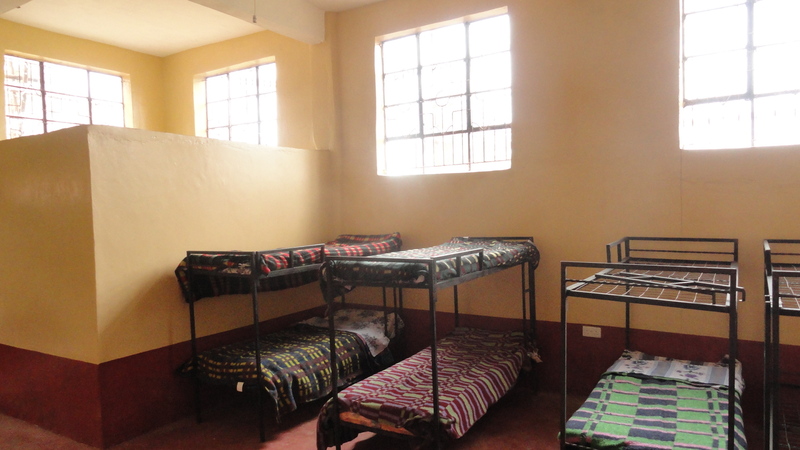 While this has cost more money, we feel that at times like these, the orphans and their families need our help even more. In doing this we have had to redirect money from ongoing projects. For example, two water projects that we had hoped to finish have been delayed. This is a rather cruel irony that lack of water has stopped us from doing projects that would make people less dependent on rain. The new building, which will feature an area named Diana’s Wing, will be rededicated as The Rolling Hills Residence in honor of our most generous school supporters. We had hoped that the entire building would be finished by now. Instead it will take until the end of January at the earliest to fully finish the building. One of our sponsors, Stephanie, is going to take on the responsibility of drafting a ‘Corporate’ letter. We have never sought outside support beyond our sponsors and schools but are making an overture asking for support to help defray the food distribution over costs, finish the building and undertake the two water projects that we’ve planned. Despite the delays there has been progress with the building. 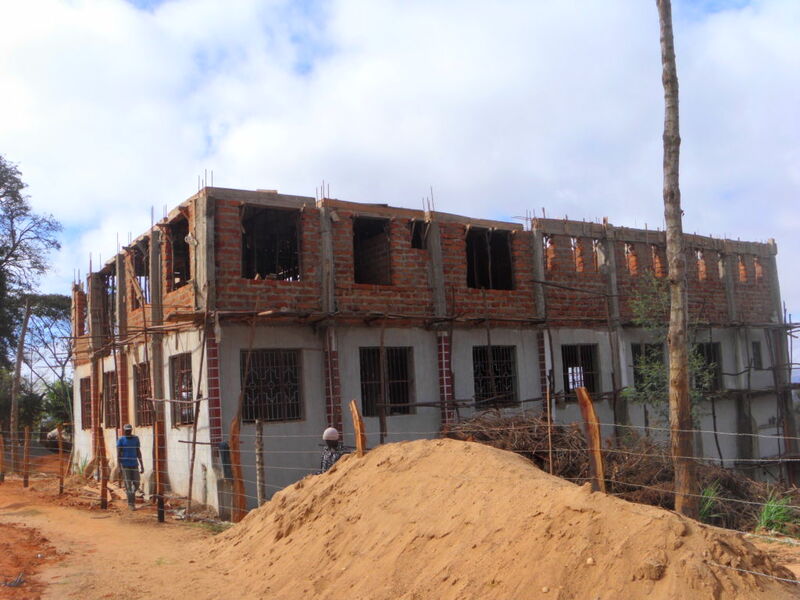 In September the boys moved into the completed two lower floors of the building! This allowed the girls to ‘expand’ to take over the entire older building. The dining room is now finished and the children use it for meals and for the study area. Ultimately this whole floor will be available to be ‘rented’ out to community meetings and the revenue will help support the orphanage. 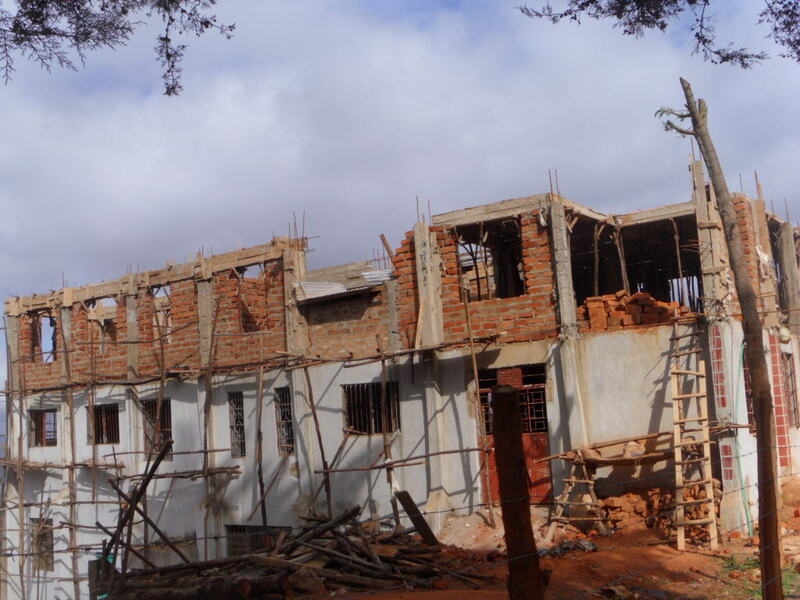 The top floor, the girls’ residence (Diana’s Wing) is now taking shape. This building is the keystone of the entire project – not just the children’s residence, but the offices which will house the outreach and community programs, and will host the local and regional conferences to generate income. This picture is taken from the side, at the top of the hill. The white, plastered layer is the kitchen/dining area/study area which will also double as a conference area. 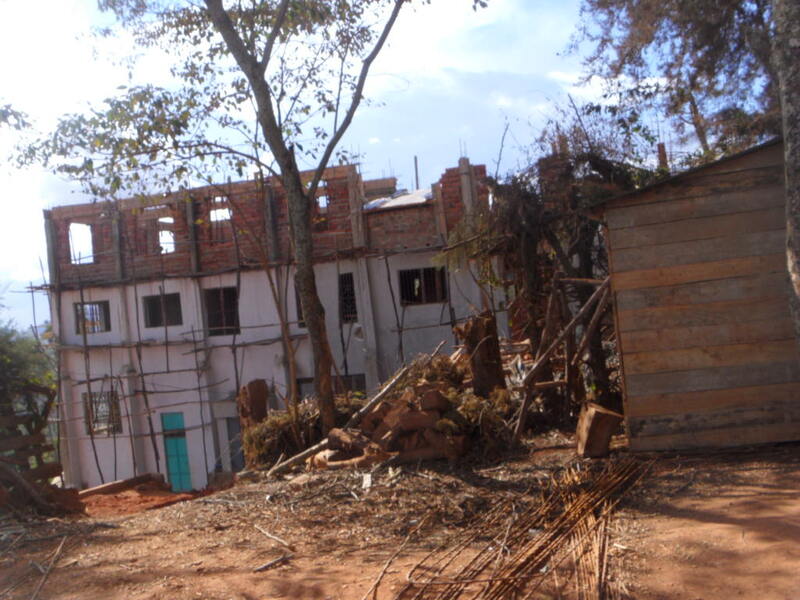 The bricks being completed on the top layer and are locally made, are going to be the girls’ residence – Diana’s Wing – as well as offices for the entire program. This is a side view that shows the main door (in red). This shot shows how the building flows down the slope. The green door on the far left is the side entrance to the boys’ residence which is subdivided – little boys on the lowest level and older boys on the next level. 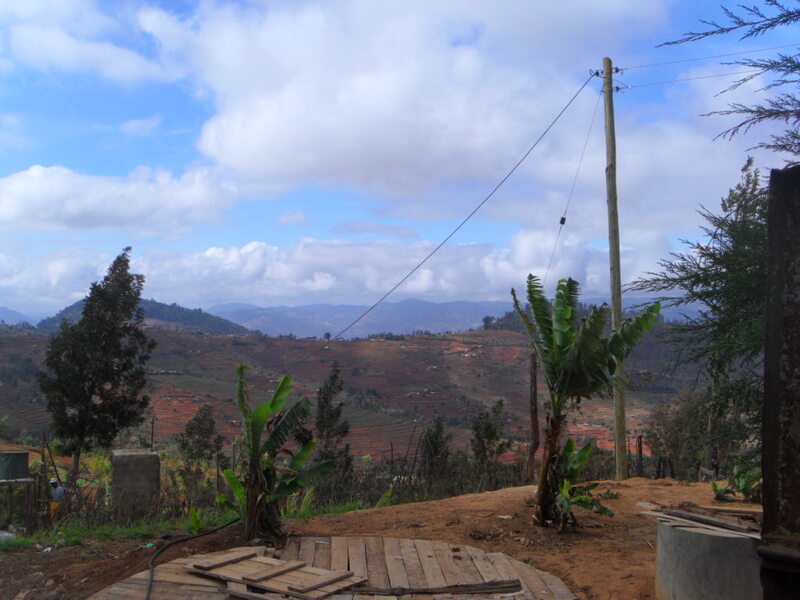 This next picture shows the electrical line leading down to the pump house (the biogas pit in the foreground) which draws water up from our well. You’ll note in the picture lots of ‘reds’ and ‘browns’. If the water situation was normal these would be green with growing crops. One of our newest sponsors, Melanie, made an incredible gift this month. She went to the ‘Needing to be Sponsored’ section of the website and noticed that the children all had wish lists needing to be filled. She sponsored six wish lists! Thank you so much for your generosity Melanie. Six children will have their lives changed, and of course, you will receive pictures of each child and each item. Kate Stadium was made in honor of Kate Dawber who had a two month placement in Kikima working at the school and helping at the residence. Kate and her family are amongst our most generous supporters and part of that support has been to provide the school with sports equipment, uniforms and facilities. Her father, Fred, has decided that they might need some new equipment and provided a further donation as part of Kate’s birthday gift, to fund this. Once again we asked our sponsors if they wished to get involved in providing a donation for Christmas. We asked that people provide NO MORE than $30.00 for their child. Some sponsors have not only made a donation for their child but have also made a donation for other orphans in the family or for other people in the community. The generosity of our sponsors continues to inspire me. We have four new sponsors this month – one from British Columbia. Four more children, and their extended families including other orphans, have had their lives changed because of these generous sponsors. Our sponsors Chris and Kelly love Halloween. Last year they combined their love of Halloween with a desire to help the program. They held a party with donations going toward the children in our program. The location was at Lou Dawgs in Toronto. Two weeks after the party there was a tragedy when one of the D.J.’s at the gathering, Andrew Curling, suddenly passed on. Subsequently the money raised by the gathering was placed in a fund, named after Andrew, to support high school fees for orphans. Last year 15 children attended high school with the money raised through this program. Once again Kelly and Chris are holding their party. This money will again be put to use, honoring Andrew, and helping to pay for 22 children to attend high school. Their school year begins in January. It is estimated that we will need a total of approximately $4500.00 to fund their year of education collectively. We won’t know the exact numbers of students until they write their exams in November. Unknown also is the total cost because their scores on these tests determine what level of school they can attend. Better marks open up better and more expensive schools and we have made a commitment that if they score the marks, we can find the money! Last month I noted the fund raising efforts of John M. James P.S. in Bowmanville but failed to put in this wonderful picture – I guess this just gives me a second chance to note their efforts and extend our thanks! Thank you Sarah for giving me a gentle reminder that I had neglected to put in the picture. September is the time that schools across the country start fund raising again for our program. We will, as always, make sure that 100% of funds donated from schools and students go directly to service, and then through the website, show exactly how we used the money. Our first school to donate funds is Glen Park Public School, which donated $492.00. 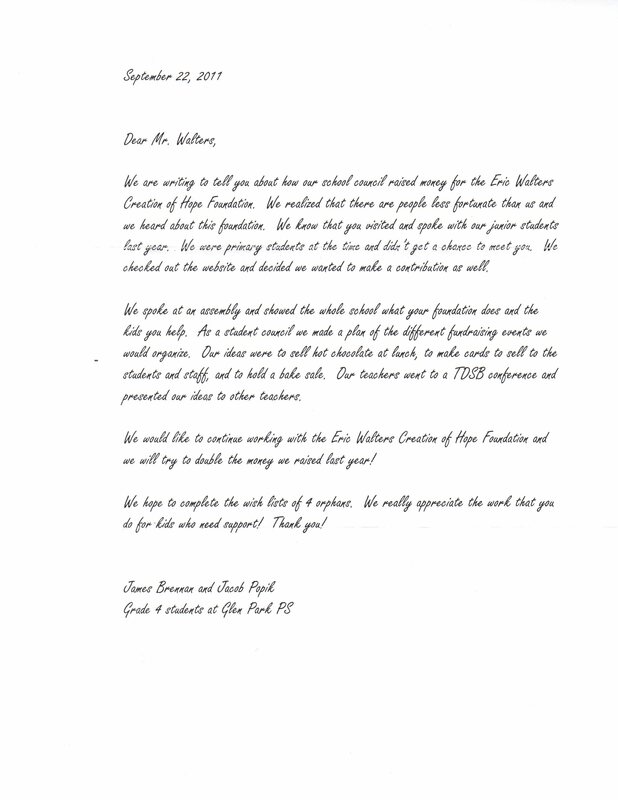 Below is a letter from two students explaining their fund raising efforts. Their principal Susan Hearn, took on a great leadership role and we’re very grateful for all of her help. These funds will be used to grant wish lists of children needing to be sponsored, as requested, and the specific children will be shown when those lists are granted. We look forward to new and exciting progress in the 2011/12 school year. Thank you for your ongoing attention, support and care!